With school ending just around the corner, that means one thing to your librarians...time for summer reading! That's right. Sign up for our Summer Reading Program begins Monday, June 1. Who can sign up? Anybody. Yep, babies through grownups have a chance to sign up for our programs. Stop by any of our desks to get info about what's going on, pick up a flyer, and sign up for summer. With everything from computer classes to music to crafts and creativity, there is something for everyone at your Tigard Library. "Ready! Aim!" Joe, Fred, and Sam do not want to hear what comes next, especially while they are looking down the barrel of gun sticking out of a "flying-saucer-shaped thing" with a bunch of guns sticking out of it. The Time Warp Trio always manages to find themselves in a heap of trouble. As if it’s not bad enough that they tend to end up in life-threatening situations, it’s always in either the faraway past or the faraway future. One year for Joe’s birthday, he received a mysterious book. It somehow has the power to transport him and his friends through time. In this case, the guy aiming the guns at them is, you guessed it, the one and only Leonardo da Vinci. They are hoping to solve the mystery of where the book came from and think Leonardo may be able to help. But in the meantime, they get taken prisoner by Captain Nassti. The only way they can convince him and his boss, Lord Borgia, to let them go is to show them a small part of an important invention called the Power Drain that will help Nassti and Borgia to conquer an empire. The only problem is, the Time Warp Trio hasn't actually invented the invention that will conquer an empire yet. And if they can’t show Nassti the invention, they will have to join his army. Will they be able to come up with an invention in time? Will Leonardo help them with their invention? Will they discover where the book actually came from? To find out, read Da Wild, Da Crazy, Da Vinci, by Jon Scieszka. If you like this one, it is a part of the series, The Time Warp Trio. This is a great series for kids from about 2nd to 4th grade. 101 Kid-Friendly Plants by Cindy Krezel. Contains over 100 plants that are safe to use around children. by Karen Leibreich. Published by locally renowned nature publisher, Timber Press. Includes growing vegetables, fruit, and herbs. Children's Gardens: Twelve Theme Gardens for Families by Edwin L. Howard. A nice little book with theme garden ideas for your backyard. A Child's Garden: 60 Ideas to Make Any Garden Come Alive for Children by Molly Dannenmaier. I just love this book with its beautiful photos and can't help but wish I had these theme gardens when I was growing up. Hollyhocks and Honeybees: Garden Projects for Young Children by Sara Starbuck. Includes some great activities for youngsters in teaching them about gardening and nature. And let's not forget the kids! A mother and child plant a rainbow of flowers in the family garden. This book is also great for learning colors. Mr. McGreely plants a garden he has always dreamed about but then rabbits persistenly come into his garden and eat his vegetables. Up, Down, and Around by Katherine Ayres. This book has fun illustrations showing how different plants grow down into the soil, how vines wrap around, and how peppers grow up. A great book that plays on words and an excellent choice for developing early literacy vocabulary skills in preschoolers. This book also makes a fun read-alound. The Gardener's Alphabet by Mary Azarian. This is an alphabet book that features words associated with gardening, such as bulbs, compost, digging, insects, and weeds. Flower Garden by Eve Bunting. A young girl and her father shop at their local store to purchase flowers and come home to create a beautiful flower pot for mother's birthday. The library also has a large collection of gardening and landscaping books located in the adult non-fiction area on the second floor of the library. If you have any home gardening questions, be sure to contact your local Oregon State University Extension Office, or visit their website at http://extenstion.oregonstate.edu/gardening for an array of gardening advice such as weed and insect management, sustainable gardening paractices, and treating plant diseases, all of which are based on scientifically unbiased research for the Pacific Northwest. We've gotten some fantastic and fun new picture books in since that last time I posted. Clicking on the title will link you to the library's catalog, where you can place a hold. Enjoy! After failing to convince her parents that she is a princess, Patricia von Pleasantsquirrel leaves her moatless house in search of a "princessdom." When Chico the monkey wakes up to a loud clatter, he puts on his tool belt and searches his tree house to find what is making the noise, only to discover Clark the elephant stuck in the laundry chute. A little mouse wakes up one day and, when he cannot find his mother, goes in search of her. I'm particularly inspired after coming back from an Early Literacy conference to share some early literacy information with you. The keynote speaker was Todd Parr, the author of Reading Makes You Feel Good and about 33 other books. I highly recommend his books for your little ones. They are fun, colorful, easy to read, and kids love the illustrations that look like they could have made themselves. His books are very encouraging and emphasize feeling good about yourself. He ends every book with a little note to his readers and always signs it "Love, Todd." For those of you who don't know, early literacy skills are skills that kids need to develop before they learn to read. No need to sit down with flash cards or anything like that; in fact, PLEASE, I beg you, don't sit down with flashcards to teach your kids early literacy skills. One early literacy skill, print motivation, is the simple thing of loving books. There are several ways you can help your children develop print motivation. Find books about topics that interest them; don't read them a book they show no interest in even if it was your favorite book as a kid. Ask them questions about the pictures and the words to encourage their participation and engagement. Take them to story times at the library. Don't force them to read when they don't feel like it; try to find times when both of you are in a good mood to share books together. Digging is one of those universal childhood things. You dig and speculate about how far you can go, what you'll find, and how long it will take. 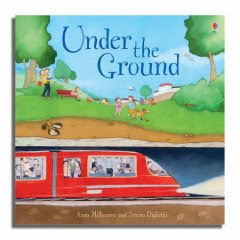 A new children's book Under the Ground takes a look from a little way down to the center of the earth. Along the way children explore plant roots, utilities, fossils, and a center so hot "the rock melts into red gloop." Add to this the super illustrations that are both informative and friendly. I especially like the end pages, which I know are just the inside flaps, but they're swirly and colorful. Summer is right around the corner and that means your library is gearing up for a super schedule of activities for the whole family. Flyers are on their way...look for an announcement here when they're ready. Some highlights to whet your curiosity...a computer camp, Hogwarts Summer School, Diary of a Wimpy Kid party, Teen Bollywood Night, Super Tuesdays, more story times, and lots of weekend programs. The theme for kids, Be Creative @ Your Library and for teens, Express Yourself @ Your Library . How fun is that!?! Hearing sounds is in important step in learning how to read. In fact, the better a child is at noticing rhymes, syllables, and letter sounds the easier it is for them to learn to read. Get your child ready by playing with sounds. 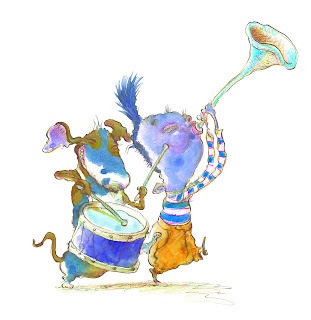 Say rhymes, sing songs, and read stories that have fun with sound. Try one of these stories to help your child hear the way words are put together. Rhyming text, body parts and super fun illustrations...it doesn't get much better. For extra fun, figure out what everyday items make up the elaborate pictures. That silly Sally! Make up your own rhymes when you're done. Addictive reading. You'll want to try to read it faster and faster, just to see if you can. Clap along to practice syllables. For more suggestions, just ask at the desk next time you're in!